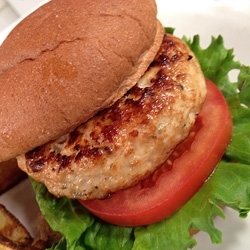 This zesty, low-cal ranch burger was created by Joy Fit Club member Clint Lehman. The melty pockets of feta cheese really put it over the top! In a large bowl mix all ingredients together. Form into 4 patties. Cook on a hot skillet, grill pan, or outdoor grill, 5 minutes per side or until cooked through. *Note: For celiac disease, check label on ranch dressing mix to ensure it’s gluten-free.